I've always been ordinary. And ordinary is pretty good, actually. I've always been smart, but never too smart. I wasn't valedictorian or a high-scorer on standardized tests. I've always been talented, but never exceptionally so. I've had my poems published in journals but I've never been nationally recognized or seen my work in The New Yorker (yet). I'm ordinary and ordinary is, actually, what most people are. There are a few people who become extraordinary in their lifetimes -- a few Hollywood success stories for the thousands that graduate with degrees in theatre; a few recording contracts for those who spend their lives making YouTube videos and singing their hearts out; a few million dollar book and movie deals for the countless others that spend their lives trying to get their work accepted by a publisher. Emma Swan has -- up until very recently -- been rather ordinary. Even when she first entered Storybrooke and became the savior of the town, she was still an ordinary person in extraordinary circumstances, dealing with the seemingly impossible. But then Emma's powers came into play and suddenly, she's on par with Regina and Rumple in town. Everyone else is a fairytale character, right? They've done the impossible: fought giants and survived, battled magical creatures, traveled to exotic locations and seen amazing sights. But they've never had the kind of power that Emma currently possesses in Once Upon A Time. And when Emma can harness that light magic within her, amazing things happen. But when she cannot -- when she begins to lose control of her emotions and herself -- people, people she loved and trust, begin to fear her. "Smash the Mirror" is a huge, two-hour episode that deals with a lot of themes (ordinary vs. extraordinary; hope vs. hopelessness; predestination vs. free will; seclusion vs. invitation; lies vs. truth; love vs. self-love, etc.) and I'll try to tackle the most important ones as they relate to our characters throughout this episode. So let's begin, shall we? I love the complexity that is Emma Swan. I love that her default response to situations is isolation, because it makes the moments that she chooses to open herself up and be vulnerable around others so much more important. In "Smash the Mirror," Emma struggles with a few of the themes I've noted above, chief of which is this contrast between seclusion and invitation. Emma is a professional secluder. She knows how to build walls to shut people out. She knows how to hurt them in just the right way so that they don't bother trying to get close again. And she's always done this because the easiest way to avoid getting hurt is if you hurt the other person first. Fear is the driving factor in isolation -- because Emma is afraid of her powers and what she can do with them (they're raging pretty out of control in this episode), she isolates herself in the woods, away from her family and Elsa and Hook. When Henry tries to coax his mother back to town, she focuses so hard on not hurting him that she ends up doing the very thing she feared doing in the first place. Elsa knows what it is like to live in constant fear of yourself and your capabilities. And, for that matter, so does Ingrid. Before she became fully crazytownbananapants, Ingrid was actually very much like Elsa and Emma -- instead of joining her sisters at parties, Ingrid stayed behind in her room. I think that Ingrid/The Snow Queen is such a great villain because she's not inherently wrong in what she believes or does or wants. Her methods are unorthodox and evil, but her desires aren't. She wants acceptance and love and a family, just like Emma and Elsa want. Elsa's spent her entire life isolated and just when she gets the chance to be accepted and loved fully by her sister, she's trapped in an urn (you know, spells and whatnot being cast on Anna by Ingrid tend to have that effect) by her. And yet, Elsa never stops wanting acceptance. That's the funny thing about isolation: you can shut yourself off from the rest of the world for as long as you want, but you'll never stop needing other people. And you'll never stop wanting them or their love. 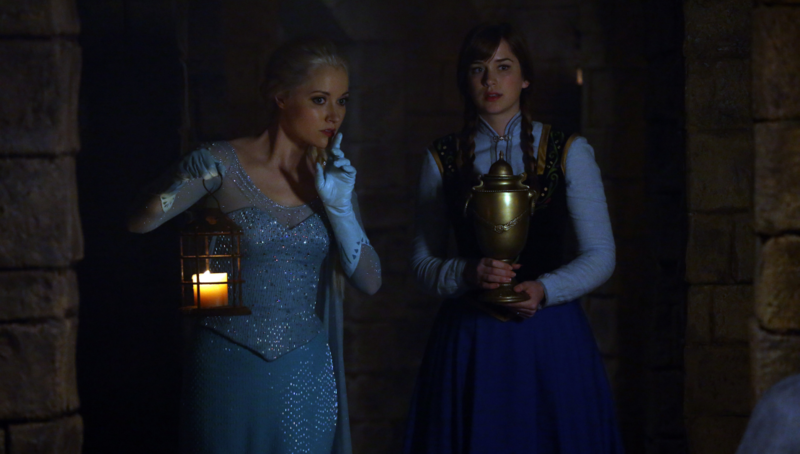 When Elsa learns that Emma is going to give up her powers, she tracks her down and confronts her in the mansion. Here's something else that was really beautiful about "Smash the Mirror": it focused on the journey toward self-love. Nearly every fairytale ends with the idea that in order to accept yourself, you have to be loved and accepted by others. Once you see how much they love you (or, in nearly every fairytale's case, once the princess sees how much the man loves her), you will love yourself, too. But that's not the case and there's this gorgeous moment between Emma and Elsa where the latter explains this idea. She tells Emma that they've been searching for love and acceptance their entire lives and while it's wonderful that they both have people who love them, that's not the answer. At least not in its fullest form. Love is the answer, but object of that love is more important: you. Emma will never learn how to harness her magic and accept herself until she learns to love every part of her -- flaws and all. No amount of family or romantic love will ever cure that. She can't ever be loved enough to fix the brokenness within her and the loneliness. She has to love herself first. And then, Elsa reaches out her hand toward Emma. It's wonderful and Emma is terrified that by touching Elsa, she might kill her. And then Elsa looks at Emma and says that she knows, but she has to take that chance. Not many people have ever taken a chance on Emma because she's never really taken a chance on HERSELF. So she reaches out her hand, allowing someone else to show her how to love and be loved, and everything (literally) changes because of that. Emma isn't magically "fixed." She's still a rather broken individual who's dealing with a lot of her own self-discovery, but I really love the fact that Elsa completely and totally understands what it means to love yourself. She knows that Anna's love meant everything to her. But Elsa also knows that until she stopped seeing herself as a monster and started seeing herself as a hero, all the love in the world couldn't fix the brokenness within. Only she had the power to do that. I love (I keep saying that, but it's true) the relationship between Emma and Elsa this season. These two are such tragically broken and yet resilient women who are just trying to love other people well. "Smash the Mirror" reminded us that the first step toward loving and helping others is often loving yourself. Snow, Charming, and Henry mean well in "Smash the Mirror," I think. The problem with Team Charming (how I will now only refer to them) is that they're comedically easily swayed (Emma wants to get rid of their powers and they support her; Regina says fifty words to them about why Emma shouldn't give up her powers and suddenly they're decidedly Team Keep Emma's Powers) and the problem with their decisions in this episode is that they're rooted in yet another theme: being ordinary vs. being extraordinary. What I love about this theme is that it's so central to our actual lives as well. Emma has spent her entire life wanting to feel special and wanting to belong and her powers make her feel that way. They truly do. They give her some sort of actual connection to the people in her town and to her family. She doesn't feel like an outsider anymore. But in this episode, we see that Emma's beginning to view her powers as a burden and a curse -- something that makes her a monster, not a hero (another huge theme this season). And that utterly terrifies her. So much so, that she seeks out Gold and desires to become ordinary again. She doesn't want to be special and unique; what she wants most of all is to be with her family without fear of hurting them. This thing that had once been a blessing to her is now not just a burden but a weapon. Team Charming supports Emma's decision (while Elsa listens downstairs) because what they always wanted was for their daughter to have the best chance at life possible. And it's interesting to them because they've spent their entire lives wanting her to accept them and the world they belonged to but now? Now they just want Emma home. They want her to be content. They want her to not be afraid of herself. And so, they feel like the best thing for Emma is then to have her powers removed: to be JUST Emma. Regina is horrified when the Charmings tell her this and how they supported her decision. Because Regina knows that powers are a gift; she knows that being ordinary doesn't solve your problems. She knows because she watched Henry long for something he doesn't have (to be magical and help his mom) and gave him a pep talk about how he was special BECAUSE he was ordinary. People are chosen to be ordinary -- not everyone has the opportunity to experience magic like Emma does and when people like her come along, they're for a reason. Regina's scolding and advice was great because it reminded us that magic is a gift in their world and rather than embrace Emma taking the easy way out by getting rid of that gift, they need to embrace her even when they don't understand that gift. That's what family is. That's what LOVE is. So let's talk about Regina. Regina, throughout this episode (and really the entire season thus far) has dealt with another one of the aforementioned themes: predestination vs. free will. Regina, in "Smash the Mirror" vocalizes that she believes in predestination and that Henry's storybook essentially confirms it -- she cannot ever get a real happy ending no matter how much she has changed or grown or how much others have forgiven her because the author has predestined her to misery by casting her as the villain. That's Regina's quest, in a nutshell, in looking for the author of the book: she wants to change something she believes to already be predestined. And where we saw her angry and determined before, we see her hopeless and defeated in this episode regarding her fate. She truly believes that her ending has already been written and that nothing she can do can change that. Regina doesn't believe she actually has the free will to change her happiness, but Snow doesn't believe that to be true (actually no one believes that to be true except for Regina at this point). In what is perhaps my favorite scene in "Smash the Mirror," Snow and Regina walk down the road searching for Emma and have a rather beautiful heart-to-heart in which Snow pleads for Regina to find hope -- even just a tiny bit of it. That is the reason, the woman cites, that she and Charming have managed to work in spite of all of the obstacles that life has thrown at them repeatedly. They have each other, yes, but more powerful than that... they have hope. They harness that tiny bit of positivity and reminder that they are in charge of their own happy endings and then they LIVE like that hope is real and -- soon enough -- it becomes real. I really and truly felt for Regina in this episode because she's so desperate to find happiness and she deserves it after all the work she has put forth to right wrongs and earn forgiveness. And what I love so much about Once Upon A Time is that it reminds us that there are no real "good" guys and there are no real "bad" guys. People are layered and flawed, even the heroes and especially the villains. I'm glad that Snow managed to vocalize this in her conversation with Regina because the woman's fixation on the storybook and claiming her happy ending is that the author sees her as a villain and so she -- in turn -- sees herself as one. But Snow reminds Regina that even though she's branded as a "hero," she was a terrible and selfish child; she cheated while David was still married; she has darkness in her heart. And if Regina's argument is that the reason Snow has a happy ending is because she's a "hero," that is inaccurate. The reason that Snow has a happy ending isn't because she's faultless and it's not because the storybook thought she was the hero. The reason is because she fights for her own happiness over and over again and never loses hope. There's a beautiful moment then, where Regina entertains the idea of hope and happiness and it actually happens: she gets a call from Robin Hood who found a page in his backpack from the storybook (page 23) of him and Regina. Within the book, page 23 depicts Regina leaving a tavern before meeting or having any contact with Robin Hood. The page in Robin Hood's bag that magically appeared? It depicts her and Robin Hood kissing. What happened in the moment Regina began to believe there was hope for her and her happiness was this: it actually came to fruition, magically. I really appreciated that moment because it reminded Regina that predestination isn't an end: just because a story writes you as a villain does not mean you have to stay a villain and it doesn't mean you cannot find happiness. Regina actively expressed hope and in that moment, the trajectory of her story began to change. Never have I hated Rumple as much as I did in "Smash the Mirror." Though it's fun to see evil vs. evil (his scenes with Ingrid were pretty great because these two villains are terrifying because of how quiet and patient they are when enacting their evil plans), it's clear that Rumple is going to forever be the character who only seeks after himself and his own twisted version of happiness. He doesn't care who he hurts in the process, quite honestly, and it doesn't matter if they are family or foe: if you get in the way of his plan, he will put you down. That's what happens to Hook when he tries to run and save Emma at the mansion. And that's what happens when secrets are kept buried too long. Hook waited until a crisis to tell Emma about what he had done with Gold and how he had betrayed people (and her trust) and he's just so pained about it, but that self-deprecation doesn't stop him from pursuing Emma. (He would literally go to the ends of the earth or time for her, remember?) I think that's pretty noble and I think that it makes everything that happens afterward extremely painful. You see, Emma chooses to not rid herself of her powers and that doesn't stop Gold -- who has tied Hook to the gate outside the mansion -- from wanting what he wants and taking it by force. Apparently the secret ingredient for his diabolical plan also involves the heart of someone who knew him before he became The Dark One. That person, as you've deduced, is Hook. Rumple (have I mentioned that he's my least favorite character on television at the moment?) cruelly mentions Mila right before he removes Hook's heart. He taunts the former pirate, noting that he eventually got over Mila and so he'll eventually get over Emma. Or, you know, Rumple will kill him before he gets the chance to do so. What a horrible blow that was, as you can see on Hook's face. Mila was the last person he truly and deeply loved before Emma and it did -- as Rumple notes -- take him centuries to get over that love. The thought of Hook being so helplessly in love with Emma and knowing that at any moment he could very well die breaks MY heart. He's come so far as a character in his growth and his love for Emma. When we met him, he was much like Rumple: someone out to get whatever he could to help himself, with little to no thought about who got hurt in the process. But by "Smash the Mirror," Hook has become this beautifully and achingly selfless character who still screws up but is desperately trying to be someone who Emma deserves. He sees the parts of him that he hates sometimes (he tries to brush those feelings off with jokes), and I think a lot of the time he wonders why Emma even chose him. I can tell you why: Emma chose Hook because she saw how much he loved every single part of her, even parts that she didn't love. She saw the breadth of his love for her when he sold The Jolly Roger. She watched him sacrifice over and over for him. She doesn't love Hook because he's perfect. She doesn't love him because he always says and does the right thing. She doesn't love him because he has a spotless past. She loves him because they're both broken puzzle pieces and together, they somehow make each other more whole. That is what love is. Love isn't being perfect or always doing right. It's about seeing the brokenness in someone else and choosing to love them anyway. Love, dear readers, is a choice. And it's a choice that Hook valiantly made and continues to make. But now, Rumple has Hook's heart and he's become a puppet for The Dark One. You can see the utter pain and desperation in his face as he kisses Emma (because it doesn't matter that he doesn't have his heart -- every single piece of him belongs to Emma Swan) because he's unsure of whether or not it'll be the last time he gets the chance to. And he looks at her so intently because he doesn't know if he will ever have the chance again and if he goes, right in that moment, she's the last thing he wants to see. And not just HER, so much as the moment she is completely and utterly happy. The rest of Once Upon A Time will be interesting, this season, because we will see Emma and the rest of our heroes trying to fight for something: happiness, hope, salvation, etc. Since, you know, Ingrid released a curse that is going to tear everyone in the town apart. That'll be fun. I hope that everyone is prepared to fight for themselves and fight for their hope and their happy endings. If there is one thing "Smash the Mirror" taught us, it's that happiness doesn't come easy for heroes or villains. Hope isn't always natural. And sometimes the hardest person in the world to love is yourself. MVPs for this episode are as follows: Jennifer Morrison for her superb acting in the scene where Emma nearly walks through the door of the mansion and gives up her powers. Those tearful moments were very genuine and powerful; Georgina Haig for basically everything she did in this episode (she was in flashbacks with Anna a lot) but especially the scene where Elsa reaches for Emma's hand in the mansion. The third MVP for that voicemail in Gold's shop is Colin O'Donoghue for the beautiful emotional work he did with Hook throughout this episode. I absolutely loved the moment in Gold's shop as well as the one outside of the mansion. Both were beautifully acted scenes by Colin. "Our love made us strong. Until it didn't." "Perhaps she doesn't want to be found. Because, you know, that's what she bloody told us." I really just love Anna so much. "I have a plan. Well, half a plan." "You royals sure go to exhaustive lengths to ignore your issues." I really miss Red/Ruby. Can we please bring her back? "Not like, party 'SURPRISE!' Something more dour to match the occasion." "This could be the worst idea you've ever had. And you hired the wicked witch as your nanny." "You get a quarter from the hope commission every time you say that." "I'm a fan of every part of you." AWWWWWWW. "I owe someone a quarter."